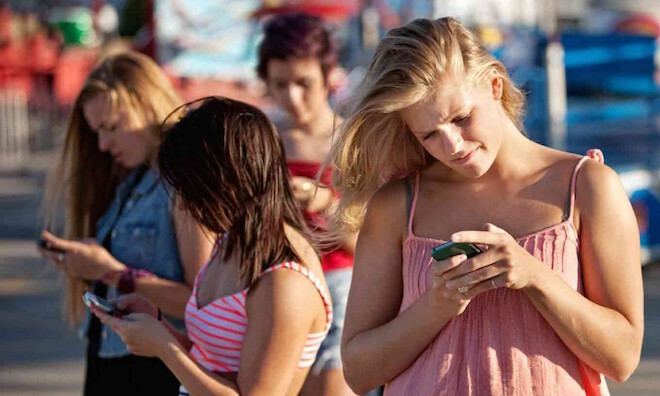 San Francisco, Calif. — A new report issued today by Common Sense Media finds that 50 percent of teens “feel addicted” to mobile devices, and 59 percent of their parents agree that their kids are addicted. Additionally, parents and children are concerned about the effects mobile device use has on their daily lives—from driving to the dinner table—with over one-third of the families in the Common Sense poll arguing about it daily. The Common Sense poll surveyed 1,240 parents and kids from the same households (620 parents, 620 kids) and accompanies a white paper that reviews the latest scientific research about problematic media use, including impacts on youths’ well-being and development. Together they offer a fresh, comprehensive review and perspective on addiction and media-use in the U.S. today. Common Sense initiated the research to better understand mobile technology’s impact on children’s physical, cognitive, social and emotional development and identify families’ need for support. Common Sense’s white paper, a review of existing studies and research on internet use, technology and addiction, concludes that there is cause for concern around problematic media use, which in extreme cases can have very damaging consequences. The paper finds that multitasking, toggling between multiple screens or between screens and people – which is common for kids doing homework or socializing – impairs their ability to lay down memories, to learn, and to work effectively. Additionally, problematic media use can harm face-to-face conversation, and undermine the development of empathy. Parents and teens should avoid multitasking with devices while talking to others and replacing human interactions with technology. The Common Sense report stemmed from last November’s landmark Common Sense Census: Media Use by Tweens and Teens that indicated U.S. teens use an average of nine hours of media per day. The technology addiction research was initiated to spark a national discussion on media and technology use by acknowledging a pervasive feeling of addiction by American families and help them identify resources to resolve family conflicts and encourage responsible use of technology. Resources for families who are concerned about media use are available on the Common Sense website, including “5 Simple Steps for a Healthy Media Diet,” family media agreements and video guides, 20 Q&As that include answers to questions like: Is Internet addiction real? What are the downsides to multitasking? How can I make sure my kid doesn’t become addicted to technology? A webinar on helping families achieve media balance will be held on May 19th and will be free to the public at www.commonsense.org. To review the white paper and Executive Summary in their entirety, visit LINK. The survey is based on a nationally representative survey designed and administered by Lake Research Partners and conducted by telephone using professional interviews from February 16 to March 14, 2016. A total of 1,240 interviews were conducted with parents (n=620) and their children (n=620) residing in the same household. Respondents were screened to be parents of children between the ages of 12 and 18 living at home with them, with both parent and child using a mobile device. The data for the parent and children sample were weighed slightly by gender, region, age, and race to reflect attributes of the actual population. The margin of error for this sample is +/-4.0%.